Early field experiences, or those that come early in a teacher’s preparation before more formalized opportunities like practicum and student teaching, can provide a venue for pre service teachers to practice technology-specific instructional decision-making and reflective practice. Although research exists on the potential roles of field experiences in teacher education, little research exists on early field experiences, especially those taking place in informal contexts. Moreover, little research exists examining how those early field experiences in informal spaces might shape preservice teachers’ use of digital learning tools. To address this gap, an inquiry was conducted to better understand teachers’ early field work experiences in informal science contexts and the use of formative assessment technologies. Researchers used a mixed methods design to examine how early field experiences might support authentic and robust opportunities for teachers in training. Results suggested that technology-focused early field experiences can serve as confirmatory events for preservice teachers, afford them opportunities to apply theory and content knowledge to practice, and contend with issues related to technology integration, instructional planning, classroom management, and even attendance within an informal context. Findings could be used to improve the design of early field experiences for preservice teachers, and facilitate the scaffolding of the opportunities to help them better integrate technologies into those experiences. Meaningful technology integration that supports teaching and learning is no longer considered an optional add-on skill that preservice teachers should hone once they become practicing teachers (U.S. Department of Education, 2016). Although some preservice teacher education programs are addressing technology integration in innovative ways, many teachers may still not be using technology effectively to support instruction (Kumar & Vigil, 2011; Neiss & Gillow-Wiles, 2013), even though preservice teachers appear to have both the capacity to integrate technology effectively and ample opportunities to practice doing so (Irving, 2009). These discrepancies, along with the difficulty of integrating technology in authentic contexts, highlight the challenging nature of technology training in teacher education (Wetzel, Buss, Foulger, & Lindsey, 2014). The complexity of the teacher education landscape is likely to grow because of the accelerating pace of instructional technology innovation. These innovations result in ongoing pressures placed on teachers to transform instruction and integrate cutting-edge technologies (Williams, Foulger, & Wetzel, 2009). Consequently, teacher education programs need to reevaluate how they prepare new teachers to use technology (Ottenbreit-Leftwich, Glazewski, & Newby, 2010; Ward & Overall, 2011). Effectively training preservice teachers to teach in these rapidly evolving contexts is pushing schools and colleges of education to reconceptualize traditional teacher preparation programs (Pamuk, 2012). According to research one cannot accurately assume that today’s preservice teachers, who are often digital natives, are capable of effectively transferring the technical skills they use in everyday life to the practice of teaching and learning (Lei, 2009; U.S. Department of Education, 2017). Preservice teachers often struggle to transform their everyday knowledge and use of technology to classroom contexts relevant to teaching and learning (Kumar & Vigil, 2011). Teacher educators can facilitate this transition, which may better direct preservice teachers to leverage those same technologies effectively to support their own teaching. Most, but certainly not all, preservice teachers have the necessary technical foundations with technology; therefore, instruction in teacher education programs need not focus on technical skills, but instead on the process of technology integration (Blankson, Keengwe, & Kyei-Blankson, 2010). A key to ensuring that preservice teachers are capable of thoughtfully and carefully integrating technology is including well-designed educational technology-specific field experiences that emphasize pedagogy and structure opportunities for preservice teachers to explore digital learning possibilities (Kovalik, Kuo, & Karpinsk, 2013). These occasions should allow preservice teachers to have opportunities early in their preparation for learning how technology integration intersects and interacts with the many other facets of teaching and learning, such as planning, implementation, and assessment (Ertmer & Ottenbreit-Leftwich, 2010; Funkhouser & Mouza, 2013; Gronseth, et al., 2010; Meagher, Ozgun-Koca, & Edwards, 2011). Therefore, teacher educators must plan for and build opportunities where teachers can acquaint themselves with technology (Russell, Babell, O’Dwyer, & O’Connor, 2003). The opportunities might include clinical experiences like service learning projects, practicum experiences, and student teaching. Early field experiences are yet another approach for providing preservice teachers occasions to design and practice technology-rich instruction in an authentic context with real K-12 learners. For the purposes of this study, early field experiences are operationalized as field experiences that occur before the more structured and time-intensive practicum, methods course, and student teaching opportunities commonly found in teacher preparation programs (Denton, 1982). Although limited research on early field experiences exists, initial early field experiences can provide opportunities to engage in pedagogical reflection (Armaline & Hoover, 1989) and serve in establishing a connection between theory and practice (Hixon & So, 2012). An additional benefit of these experiences is that they afford preservice teachers chances to explore unarticulated beliefs that have shaped their conception of teaching in a space of high reality and complexity (Hixon & So, 2012). Research on early field experiences also indicates that they provide preservice teachers opportunities to explore their own educational beliefs, self-assess their motivations for entering teaching careers, develop self-confidence, and gain an understanding of children (Bennie, 1982; Byrde & Garofolo, 1982; Erdman, 1983). Teacher education programs can use field experiences to support these processes, serving as a place for teacher learning, not just application of theory or skills (Zeichner, 2010). Early field experiences might also provide opportunities for preservice teachers to practice instructional decision-making and reflective practice. Gallego (2001) encouraged teacher educators to engage better in community-based opportunities for preservice teachers’ field experiences, much like those presented in this study. He stated that “these outreach efforts work to establish connections with potential future university students as well as provide practical opportunities for current university students to apply and develop disciplinary knowledge” (p. 314). He also suggested that afterschool educational enrichment programs can “aid in the understanding of teaching and learning in school” and that these types of experiences are of particular interest because of “the contrast between the unfamiliar community setting and the familiar classroom environment is likely to prompt an awareness of implicit instructional notions” (p. 314). This community-centered approach resonates with Darling-Hammond’s (2014) and Liu’s (2012) calls for teacher preparation programs to couple theory-based courses with school-based field experiences where preservice teachers are encouraged to participate in all aspects of teaching and learning. Liu (2012), for example, noted that, “although teacher education courses can equip preservice teachers with technology skills or promote instructional strategies, those courses remain insufficient for teaching practice using technology” (p. 145) because they must be paired with field experiences in order to realize the full potential of these experiences. Despite the research on the benefits afforded by early field experiences, some researchers have argued that the value of these experiences might be limited, due to factors such as pressure on regular classroom teachers, competition for time, and lack of university involvement in early field experiences (Bennie, 1982). Goodman (1985) suggested that these constraints leave preservice teachers with little opportunity to reflect upon their teaching experiences or experiment with curriculum or instructional strategies. Other researchers have argued that the clinical experiences must be carefully coordinated and connected with campus courses to be effective (Zeichner, 2010). The mixed methods study reported in this paper focused on reflection data from undergraduate preservice teachers enrolled in a foundational educational technology course featuring an elementary school-based early field experience. This course at a 4-year Rocky Mountain public university is a requirement for all university students enrolled in the teacher education program prior to entering their practicum experiences. A central component of the course was participation in an afterschool educational technology club, known as Tech Club. Tech Club was designed to be a community-based early field experience that couples a theory-based course with an early, prepracticum and student teaching, clinical field experience (as recommended by Darling-Hammond, 2014; Gallego, 2001). For Tech Club, preservice teachers engaged in roughly 12 hours of instruction in the afterschool programs. This school-based field experience is a part of a joint venture between the university, local school districts, and a community organization that organizes the afterschool programming within the district. Although preservice teachers experience a variety of foci and contexts in their Tech Club work, this study looked at preservice teachers who delivered a National Science Foundation grant supported science curriculum (DRL 1423561) at local elementary schools prior to beginning their student teaching experience. As a result, for many of these preservice teachers, this experience was their first in a teaching role. Participating preservice teachers who were randomly assigned to several afterschool sites were required to implement a technology-rich, curriculum focused on science, technology, engineering, and mathematics (STEM). An instructional design team comprised of subject matter experts, STEM researchers, and educational researchers designed the curriculum and provided it to the teachers. The emphasis of this curriculum was on a series of core scientific concepts, including the conservation of energy, conservation of mass, the water cycle, and the carbon cycle. Further, a key component of these lessons was using technology to explore innovative avenues to assess student learning and engagement. As indicated, although research exists on the critical role field experiences play in adequately preparing preservice teachers for the profession, one area lacking substantial current research is that of early field experiences. Additionally, little research currently exists on how early field experiences can be used to provide preservice teachers opportunities to explore digital learning, and in particular, assessment technologies. As suggested by Liu (2012), studies exploring the impact of the combined effect of field experiences and teacher education courses are lacking. Therefore, this inquiry was conducted with the intent to increase the field’s understanding of preservice teachers’ experiences in an early field experience in informal science learning and the integration of technology to assess participants’ engagement and learning. As such, the following primary research question guided this inquiry: How will participation in an informal science learning early field experience focused on assessment technologies affect preservice teachers’ perceptions of teaching, learning, and technology? The study used both qualitative and quantitative measures to examine preservice teachers’ experiences in an afterschool science context and focused on technology integration with teaching and assessment. The digital assessment tools used in the program included Google Forms (Google, 2016), Plickers (2016), and Nearpod (2016). Although afterschool participant, nonpreservice-teacher assessment data were also collected using these tools for a separate study, data collection for this inquiry focused instead on preservice teachers’ perceptions developed during an early field experience focused on using these digital learning tools for the purposes of assessment. The participants in this investigation (n = 32) were preservice teachers enrolled in a foundational educational technology course, representing a narrow range of ages from 19-24 and roughly 60% female, prior to completing their student teaching experience. These preservice teachers visited the local afterschool programs once a week for one roughly 1 hour over a 6-week period. Three primary data sources were analyzed for this investigation: preservice teachers’ reflections during the field experience, a field experience survey, and the focus group interview. An overview of these data sources is reviewed in Figure 1. Figure 1. Overview of data sources. First, preservice teachers completed a weekly reflection form containing questions aimed at fostering rich and evidence-based reflections on teaching and learning. The reflections focused on three key prompts and asked the preservice teachers to reflect on what they taught, what challenges and successes they faced during instruction, and what they might do differently next time if they were reteach the lesson. Each preservice teacher completed between three and 16 reflections as a required portion of Tech Club during their field experiences in an informal science education program, resulting in 135 total reflections for all preservice teachers combined. All 32 pre-service teachers voluntarily returned the field experience survey. The instrument contained demographic items, as well as five items concerning how participation in the early field experience impacted preservice teachers’ perceptions of teaching and learning (Table 1). Responses on this section of the survey were collected using a 4-point Likert-type scale, with response choices of strongly disagree, disagree, agree, and strongly agree. Survey items were composed so they tightly aligned with several key components relevant to the desired outcomes of the early field experiences, as well as the teacher education programs guiding conceptual frameworks. In addition, data sources included observational memos taken during the instructional events. Last, a focus group (n = 3) was conducted and facilitated by the researchers using a set protocol, with our interpretations and claims sent out for a member check. The qualitative data, as provided by the preservice teacher reflections and the focus group, were analyzed following a grounded theory approach using an inductive coding scheme (Savin-Baden & Major, 2013). Results were collected and entered into the qualitative data software program NVivo (QSR International, 2014). To begin this process, we established referential adequacy by running three coding iterations. In the first iteration, the transcriptions were segmented and labeled in an open-coding format. In the second iteration, the newly established codes were assessed to reduce overlap and redundancy. In the final coding iteration, key themes were identified based on the verified codes in light of the research question. Once the data were organized into themes based on the reflections, an explanatory effects matrix was developed to begin to help us understand the relationships between themes, such as cause and effect relationships (as recommended in Miles, Huberman, & Saldana, 2013). An explanatory effects matrix is intended to be a broad overview of the outcomes from the experience and what caused them to occur. As a first step for this matrix, the coded preservice teacher reflections were reanalyzed with an eye toward how the identified themes are related. In many cases, reflections served as evidence for multiple themes, showing direct connections between the themes. For example, a preservice teacher reflection may discuss how students being tired (participant factor), made it difficult for them to manage the learning environment (management issues). The reflection makes clear connections between the participant factors and management issues;, thus, an effects matrix uses a line to show the possible cause and effect relationship. The different iterations of the effects matrix were then used to create a network analysis (Figure 2), a larger comprehensive network of the potential individual cause-and-effect relationships. During this process, the many iterations of the network were interrogated using the research question and the exemplar quotes to ensure that the connections made were representative of the preservice teacher experiences. Next, these themes served as the basis to create the focus group questions, both acting to extend the nature of the themes present in the reflections and, also, as a form of member-checking. The focus group interview was recorded and transcribed verbatim and was used to analyze and support or challenge the network analysis findings. Quantitative data analysis of the field experience survey employed basic descriptive statistics, including mean, standard deviation, and correlational analysis. Those data were intended to serve as a triangulation source to corroborate qualitative findings and focused on how the field experiences influenced the preservice teaches’ perceptions of management, planning, and engagement after the completion of the field experiences. Of the 32 preservice teachers who responded, four participants were removed for missing data, resulting 28 survey responses being included in the analysis. In an effort to build trustworthiness of the qualitative inquiry, we implemented several well-established procedures during data collection and analysis (as in Gay, Mills, & Airaisan, 2012; Lincoln & Guba, 1985). For example, rich primary data was included in the findings. Reporting these primary data in the form of exemplar quotes from the preservice teachers’ final presentations illustrates the data. Additionally, these exemplar selections were internally audited with the help of a review team and openly discussed for any issues of disagreements (as recommended in Lincoln & Cuba, 1985). Member-checking was used during the focus group sessions, where participants were given an opportunity to confirm or challenge interpretations made from the reflective journal entries. 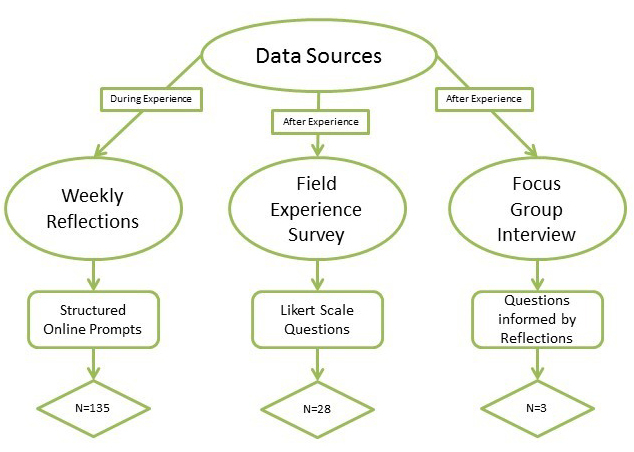 Analysis of the weekly reflection data and focus group interview yielded three categories of variables (Figure 2): rectangles describe the overarching setting of the experience; rounded rectangles describe issues or concepts linked to the preservice teachers; and factors in the ovals refer to contextually linked issues or concepts dealing with either the experience or the nature of the afterschool environment. Arrows connecting these factors show linkages between the concepts with one leading to the next depending on the direction of the arrow. Figure 2. Network for early field experiences in afterschool settings. The resulting network shows the varying experiences of the preservice teachers who were required to teach in an afterschool (3) technology education program (1, 2) using a prescribed curriculum integrating assessment technologies (2). The following results are presented using the network (Figure 2) to track the preservice teacher’s experiences, showing the diversity and potential challenges and benefits uncovered in early field experiences through their perceptions on teaching, learning, technology, and their implications for future practice. However, when asked to summarize the experience in one word, a preservice teacher during the focus group said, “Confirming… like who you want to be as a teacher.” This preservice teacher further explained that the direct experience with different-aged students, as well as their content knowledge, played into their switch to a middle school versus elementary school focus for their undergraduate education. This result reinforces suggestions regarding the potential of authentic early field experiences to help preservice teachers better determine if teaching is the profession for them. Perceptions on Teaching. The prescribed curriculum integrating assessment technologies (2) was originally designed to lower the stress associated with planning and preparation (5) for the environmental (7) and participant factors (4) present in afterschool settings (3). Lessons focused on hands-on activities meant to foster participants’ understanding of science. The curriculum went through several iterations, each time improving the ability of the lessons to engage students (8). However, preservice teachers may have assumed that a prescribed curriculum (2) minimized the need to plan or prepare (5). This assumption may have resulted in reducing the overall effectiveness of the curriculum (2), as some preservice teachers failed to respond to the changing needs of the context (10). Next time I would definitely like to be more prepared in what we are teaching. I felt like I procrastinated in reading the lesson plan, which definitely made the sequence of the procedure seem more difficult to me. Also, I think our group needs to do a better job of stating our expectations right off the back [sic] rather than trying to introduce a new step while the kids are distracted. In several instances preservice teachers struggled with being flexible and were unable to show adaptability (16) in the reflections. For example, one preservice teacher said, “Nothing about this lesson worked,” without providing any suggestions for iteratively improving the lesson, despite being prompted to do so. The kids came in directly from playing outside, they had lots of energy and not much focus. Simply asking questions to begin the lesson, I feel, was somewhat simple, where a more engaging warm-up would have been more effective. The first thing that I will do differently would be to organize the lesson plan so that the big ideas are more explained instead of trying to go over so many thoughts and ideas. The second thing that I would do differently would be to find a way to incorporate more technology. Perceptions on Student Learning. Learner engagement also played a role in shaping the experiences of the preservice teachers, who quickly identified participant engagement (8) as a key factor in how effective they perceived the lesson to be (17). Perhaps the most powerful reflections from the study came out of preservice teachers’ efforts to maintain participant engagement and (8) to mitigate management issues (9). Next session we need to work on classroom management skills and try to keep the students more engaged in the lessons by making it more interesting and relevant to them. Also, I will have a backup plan for nest [sic] time when using technology, so that if it does not work, then I will be prepared with another option in how to teach the concept. Students continue to push the envelope regarding what they can and cant [sic] do during science experiments. Very thorough explanations and expectations must be laid out prior to the start of any experiment. From this weeks [sic] lesson I also learned that students respond really well to experiments that are “fun.” They are more willing to participate and ultimately learn more if the experiment is engaging. Perceptions on Technology. Suggestions from preservice teachers indicate that technology (2 and 13) played a clear role in participant engagement (8) in the program. There were many instances where the preservice teachers stated that the participants were excited about using technology. Some preservice teachers took this notion to the extreme, saying that without technology the students would not have been engaged. Others brought a new dimension to the conversation, looking at the ability of these integrated technologies to not only foster engagement but also to enable assessment and add relevancy to the curriculum (12). Future Professional Development. One of the prompts in the weekly reflection asked preservice teachers to discuss the changes that they intended to make for following lessons. Most responses to this question focused on large overarching concepts specific to teaching, learning, and technology (11) rather than on specific small changes within the context of the program. One student commented, “It would prove beneficial if I personally knew the material better so that teaching the concepts would be easier. Id [sic] be able to better cater to the array of differing learning styles,” which speaks of the importance of content knowledge and differentiation in teaching. Another student mentioned that they “need to work on better management techniques to bring the attention back to me. In this session I found myself yelling instead of trying to get the students’ attention in another way and then talking in a normal voice.” In this quote, the preservice teacher expressed both the inherent value of learning management techniques and an emerging understanding of their personal approach to teaching. Both of these specific reflections have merit well outside the context of an informal setting. These two quotes also resonate with some of the most heavily discussed areas in terms of future teaching and learning (14). As indicated in Figure 3, management and planning were present in almost half of the preservice teacher reflections. Other themes such as assessment and content knowledge were evidenced in other preservice teachers’ responses, showing the diverse outcomes that preservice teachers experienced as a result of this experience. The Field Experience Survey was collected using a 4-point Likert Scale (strongly disagree-1, disagree-2, agree-3, strongly agree-4), and basic descriptive statistics are provided in Table 1. Given the low sample size (n = 28) and the consistent responses of the preservice teachers, the survey may lack discriminant validity. Additionally, it should be noted that the field experience survey was sent out after the completion of the early field experience. Therefore, the mean scores suggest a largely positive experience overall, despite the challenges encountered as shared in the weekly reflections. This contradiction my mean that, despite the difficulties of early field experiences in informal contexts that integrate technology, the early field experiences were still considered worthwhile for the preservice teachers. [a] Correlation is significant at the 0.05 level (2-tailed). [b] Correlation is significant at the 0.01 level (2-tailed). Exploring the correlations between the field experience survey items aligns with many of the qualitative findings. First, the correlation between ability to effectively teach and manage students (r = 0.700, p < 0.01), which was a theme in the qualitative data, suggests a link between management issues and perceived lesson effectiveness. Also, correlations between understanding student differences and effective teaching (r = 0.769, p < 0.01) and management (r = 0.688, p < 0.01), may point to preservice teachers’ understanding that participant factors impact engagement, management, and curriculum. These findings are corroborated in the qualitative network analysis. Finally, the lowest scored item on the survey concerning developing activities and lessons that engage student did not significantly correlate with any other item. This result aligns with the qualitative findings that suggested preservice teachers struggled to plan effectively and prepare with a prescribed curriculum to fit the changing dynamics of an informal context. The focus of the study was to examine how participation in an informal science learning early field experience focused on assessment technologies affected preservice teachers’ perceptions of teaching, learning, and technology. While the focus group participants and much of the literature touted the advantages of using technology in informal settings, preservice teachers often struggled to use these tools effectively. Due to both environmental factors of student interest and the educational technology chosen, preservice teachers often failed to use technology as an assessment tool or even as an integrated component of the lesson. Moreover, when preservice teachers experienced difficulties, they seemed to be unable to react in a constructive manner and would often then struggle to manage the class or maintain student engagement. The limitations experienced by the preservice teachers may have been mitigated by proper lesson preparation or by using different assessment technologies or programs. Yet, as echoed by a focus group participant, as a major finding of this study, it may be the experience that comes from being in situations such as those experienced in the informal setting that fosters more flexible and responsive teaching methods and approaches. Additionally, these findings align with research showing the potential negative impacts on teacher perceptions when using technology in field experiences, as well as the important role reflective practices play in encouraging positive experiences with educational technology (Hixon & So, 2009). Another major finding of the study that aligns with previous research is that early field experiences can act as confirming events, as well as offering opportunities to apply knowledge in authentic teaching contexts (Bennie, 1982; Byrde & Garofolo, 1982; Erdman, 1983; Zeichner, 2010). Teaching in informal environments like afterschool programs provided unique planning, management, and even attendance issues, consistent with prior work (Lemke, Lecusay, Cole, & Michalchik, 2016). The extent of these very challenges, however, may have been what encouraged the preservice teachers to reflect on their views on teaching, learning, and technology. For example, if teacher educators couch technology training in teacher education in constructionist learning theory and consider how to provide the reflective prompts that encourage preservice teachers to show their process of knowledge construction in terms of teaching, learning, and assessment, we may be able to enable those preservice teachers to grow more deeply from the experience (Savin-Baden & Major, 2013). These authentic challenges may have stimulated both improvisational teaching skills and application of prior learning, which is consistent with constructionist pedagogy. Yet, whether the preservice teachers were cognitively unprepared or if they ran into too many technical difficulties, they clearly encountered barriers that proved insurmountable to some. These findings then challenge the notion that the constructionist pedagogies would motivate them to “problem solve and learn competently” (Savin-Baden & Major, 2013, p. 30). The design of the Tech Club described here, coupled with findings from this study, challenge several principal findings from other studies. In particular, findings from this study contradict earlier research indicating there can be a lack of university involvement in early field experiences (Bennie, 1982), that early field experience lacks opportunities for critical reflection (Goodman, 1985), and that coordination between the field experience and accompanying teacher preparation courses is often missing (Zeichner, 2010). First, the context for the Tech Club was an afterschool program. The Tech Club experience was built upon the premise of a symbiotic partnership between the university and the local school districts and afterschool programs. The university provides willing adults who can provide the afterschool partners with support and resources; the school district and afterschool partners provide a context for the preservice teachers to engage in authentic teaching practice. Second, reflection was a core component of the preservice teachers’ early field experience. Each visit was followed by private, structured reflection time in which preservice teachers shared their experiences with the instructor via a private blog. Additionally, these reflections provided the foundation and content for the final presentations, in which they shared about their experience at the end of the semester. The clinical experience was tightly connected to the on-campus class (Darling-Hammond, 2014; Liu, 2014). All instruction and preparation for the fieldwork was delivered through the educational technology course, and preservice teachers continually discussed and reflected on their Tech Club experiences during class time. The design of the Tech Club experience also aligns with Gallego (2001) and Darling-Hammond’s (2014) call to reenvision the types of partnerships between universities and schools established to support teacher training. Tech Club design makes innovative use of a unique partnership between the university, school district, and community organization that runs the local afterschool programs context to afford preservice teachers opportunities to put their theories into practice. To this end, the Tech Club program provided clearly rich and challenging experiences, enabling preservice teachers to reflect on their views of teaching, learning, and technology. Several limitations constrain the generalizability and transferability of this study’s findings. First, the survey instrument used for the quantitative analysis has not yet undergone a systematic analysis to include reliability and validity. Another limitation of the study is the lack of more longitudinal data. It would be useful to better understand the lasting influence of the early clinical experience and align findings from this study to data collected during practicum and student teaching. This examination may provide a clearer picture of the enduring effects of early field experiences on the preservice teachers’ perceptions of teaching, learning, and technology. Last, this study was limited by the qualitative nature of the data. Although we employed several key strategies to ensure trustworthiness of the qualitative interpretations, as indicated, the possibility exists that data analyses and interpretations were influenced by researcher biases. However, we made a determined effort to mitigate this potential with the qualitative data, as evidenced in the procedures to ensure trustworthiness. Although this study focused more on the impact of an early field experience on preservice teachers’ judgments related to teaching, learning, and technology, future research may aim to better understand how preservice teacher beliefs about technology actually form. Findings from this study suggest that preservice teachers came into the experience with positive views of using technology in teaching; however, many experienced numerous barriers to integrating technology effectively. A study looking at the impact of these barriers or successes on the preservice teachers’ views on technology may shed light on how to best foster preservice teachers’ ability to integrate technology successfully into their teaching and build that critical connection between theory and practice. Particularly given the potential issues with the quantitative measures included in this study, additional tools measuring these skills and process quantitatively may be useful to teacher education programs using early field experiences to build theory to practice connections. Especially for the preservice teachers who struggled, further exploring the merits and challenges of the constructionist approach to early field experiences may shed light into how best to scaffold the debriefing and feedback process for preservice teachers, such that they can effectively interpret and build from the challenges of informal learning contexts. In summary, findings from this study suggest that teacher educators might consider reorganizing the teacher preparation sequence and begin teacher preparation with meaningful and authentic field experiences instead of the typical theory and foundations content to enable better theory to practice connections (Arristia, Rawls, Hammond Brinkerhoff, & Roehrig, 2014; Bell, Maeng, & Binns, 2013; Moore, 2003). Armaline, W.D., & Hoover, R. L. (1989). Field experience as a vehicle for transformation: Ideology, education, and reflective practice. Journal of Teacher Education, 40, 42-48. Bennie, W.A. (1982). Field based teacher education: A reconsideration? Teacher Educator, 17(4), 19-24. Blankson, J., Keengwe, J., & Kyei-Blankson, L. (2010). Teachers and technology: Enhancing technology competencies for preservice teachers. International Journal of Information and Communication Technology Education, 6(1), 45-54. Byrd, P., & Garofalo, J. (1982). Issues in conducting a pre-student teaching field experience. Journal of Research and Development in Education, 15(4), 45-52. Gallego, M. A. (2001). Is experience the best teacher? The potential of coupling classroom and community-based field experiences. Journal of Teacher Education, 52(4), 312- 325. Gay, L. R., Mills, G. E., & Airasian, P. (2012). Educational research: Competencies for analysis and applications. Boston, MA: Pearson. Gronseth, S., Brush, T., Ottenbreit-Leftwich, A., Strycker, J., Abaci, S., Easterling, W., Roman, T., Sungwon, S., & van Leusen, P. (2010). Equipping the next generation of teachers: Technology preparation and practice. Journal of Digital Learning in Teacher Education, 27(1), 30-36. Hixon, E., & So, H-J. (2009). Technology’s role in field experiences for preservice teacher training. Journal of Educational Technology & Society, 12(4), 294-304. Irving, K. (2009). Preservice science teachers’ use of educational technology in student teaching. Journal of Computers in Mathematics and Science Teaching, 28(1), 45-70. Kovalik, C., Kuo, C.L. & Karpinski, A. (2013). Assessing preservice teachers’ information and communication technologies knowledge. Journal of Technology and Teacher Education, 21(2), 179-202. Kumar, S. & Vigil, K. (2011). The Net generation as preservice teachers: Transferring familiarity with new technologies to educational environments. Journal of Digital Learning in Teacher Education, 27(4), 144-153. Kyei-Blankson, L., Keengwe, J., & Blankson, J. (2009). Faculty use and integration of technology in higher education. AACE Journal, 17(3), 199-213. Liu, S.H. (2012). A multivariate model of factors influencing technology use by preservice teachers during practice teaching. Journal of Educational Technology & Society, 15(4), 137-149. Miles, M. B., Huberman, M. A., & Saldaña, J. (2014). Qualitative data analysis: A methods sourcebook (3rd ed. ): Thousand Oaks, CA: SAGE Publications, Inc.
Moore, R. (2003). Reexamining the field experiences of preservice teachers. Journal of Teacher Education, 54(1), 31-42. Pamuk, S. (2012). Understanding preservice teachers’ technology use through TPACK framework. Journal of Computer Assisted Learning, 28(5), 411–424. Russell, M., Babell, D., O’Dwyer, L., & O’Connor, K. (2003). Examining teacher technology use: Implications for pre-service and inservice teacher preparation. Journal of Teacher Education, 54(4), 297-310. Savin-Baden, M., & Major, C. H. (2013). Qualitative research: The essential guide to theory and practice. New York, NY: Routledge. Ward, G. & Overall, T. (2011). Technology integration for pre-service teachers: Evaluating the team-taught cohort model. Journal of Technology and Teacher Education, 19(1), 23-43. Williams, M.K., Foulger, T.S., & Wetzel, K. (2009). Preparing preservice teachers for 21st century classrooms: Transforming attitudes and behaviors about innovative technology. Journal of Technology and Teacher Education, 17(3), 393-418. Zeichner, K. (2010). Rethinking the connections between campus courses and field experiences in college- and university-based teacher education. Journal of Teacher Education, 61(1-2), 88-99. The research effort reported in this manuscript was supported by a National Science Foundation AISL Pathways Grant (DRL 1423561).